The July release of the Federal Reserve’s Senior Loan Officer Opinion Survey (SLOOS) conducted for bank lending activity over the second quarter of this year found that banks eased lending standards and terms for commercial and industrial loans, coupled with stronger demand for loans from small firms. Banks also reported weaker demand for residential loans, confirming the softer housing data in recent months. But the highlights of this particular survey was the respondents indication that they eased standards and terms on commercial and industrial loans to firms of all sizes and kept commercial real estate lending standards about unchanged. Responding to special questions, banks reported that their C&I lending standards were easier than their median lending standards between 2005 and 2018. Banks also reported that their CRE and residential lending standards were slightly tighter than their median lending standards between 2005 and 2018. The net percentage of banks reporting easier standards on loans to large- and medium-sized firms increased (+5pp to 16%), and lending standards for small firms eased slightly as well (+5pp to 8%). Terms on C&I loans also eased somewhat for large- and medium-sized firms, as 32% of banks surveyed reportedly narrowed spreads of loan rates over the cost of funds; other terms, such as premiums charged for riskier loans, loan covenants, and collateralization requirements, all eased somewhat, which is understandable in light of recent reports of record weak covenant protection. At the same time, demand for C&I loans strengthened, with net stronger demand reported from both large and small firms. The survey comes at an apt moment, because as the WSJ reported today, while "central bank money inflated the markets for risky loans and the investment vehicles that buy many of them" now there are early signs of that driving force going into reverse. 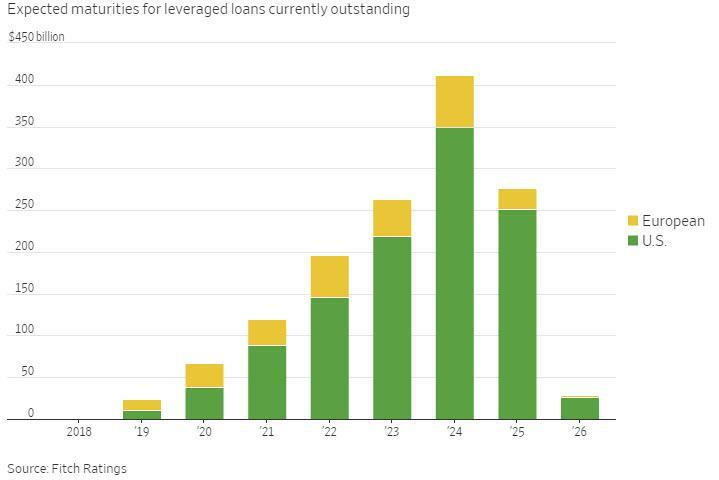 The Journal cites a growing share of new loan borrowers who have had to lift interest rates on leveraged loans to win over investors. While some speculate that this is just a "touch of indigestion" after several large deals to fund private-equity buyouts and takeovers, some bankers think it is an early signal that liquidity is retreating from low-quality debt. But a bigger sign of trouble for borrowers isn’t just the rising debt costs today, but the risk that loans will be harder to refinance in future when investor money washes back to safer assets as yields rise. This matters because more than 40% of leveraged loans are typically used to refinance an existing loan. Meanwhile, loans are popular with lenders now because yields adjust with rising rates, so they don’t lose money like fixed-rate bonds do during times of rising rates. 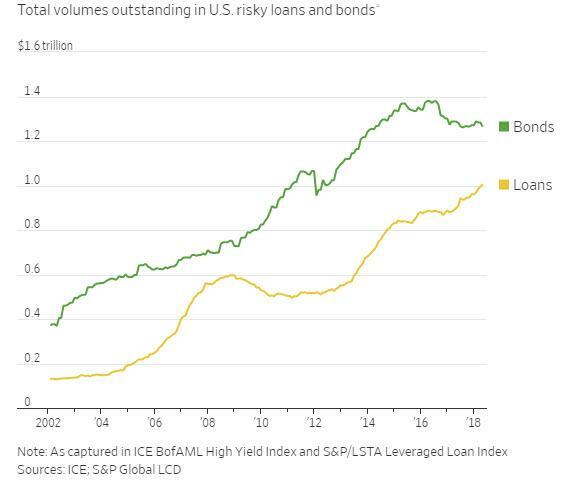 But, as the WSJ correctly notes, "the real problem lies in how investors who don’t normally buy loans will react to the end of quantitative easing, or central bank bond buying programs, which pushed them into risky loans in the first place." And with other debt instruments start offering "normal" yields and rate rises slow, investors won’t need to take risks on credit or complexity. Add this together, and you start seeing refinancing risk as higher rates will also weaken borrowers’ equity valuations and make debt a bigger chunk of their enterprise value. The same loan will thus look riskier, plus there will be less funding available if investors who typically buy bonds leave the loan market. "That is when refinancing risk jumps." For years, it was a "borrower's market", with companies dictating terms on secured packages, with covenant protections declining year after year, until they recently hit an all time low according to Moody's. However that changed in the spring when the pushback on loan pricing began and has since become more prevalent. One of the first big deals to suffer this year, according to bankers, was the $2.3 billion loan that is helping fund McDermott International’s takeover of rival engineer CB&I. Bankers had to lift the spread by 0.75 percentage points to 5% before investors would bite in April. 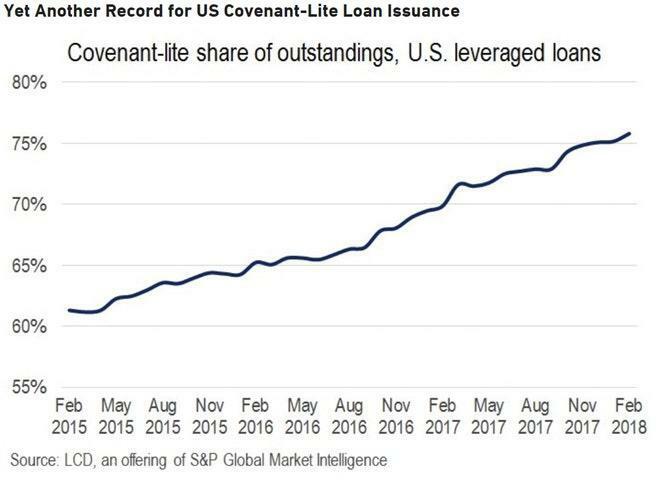 More recently, a string of loans have had to increase spreads by an average of 0.5 percentage points, according to data from S&P Global Market Intelligence’s LCD research service. In all, about 30% of new loans had to increase spreads during marketing in June and the first half of July—up from 12% in May. According to bankers, the "upward flew" happened because fewer investors who don’t typically buy loans were bidding. A similar shift was observed in new issues of collateralized loan obligations, or CLOs, the debt-funded vehicles that buy more than half of all new loans and which have been among the factor cited for the loan market recently surpassed $1 trillion and is on pace to catch up to the slightly larger junk bond market. Still, there is a long way to go before the loan market reaches full indigestion: while loan pricing may have moved against borrowers, for once, other terms remain very aggressive, even more so compared to 2007. For example, debt multiples on private-equity deals are as high as then at more than six times earnings on average, but investors complain that these earnings are often flattered by things like assumptions on cost savings. Also, as noted above, covenants that protect lenders by allowing them to act when things deteriorate have all but disappeared. They mostly still existed in 2007. Meanwhile, worse quality loans means lenders will get less money back when defaults pick up. But even without defaults, the worry is that there won’t be enough lenders to cover borrowers’ refinancing needs in years ahead. Indeed, as we reported two weeks ago, a recent study by LCD looked at the debt cushion of outstanding loans – the amount of debt in a borrower’s capital structure that is subordinated to the senior loan – and found that, increasingly, today’s cov-lite deals have little or no debt cushion beneath them. This is important because the lack of a debt cushion significantly lessens what an investor will recover on a loan, if that credit defaults. 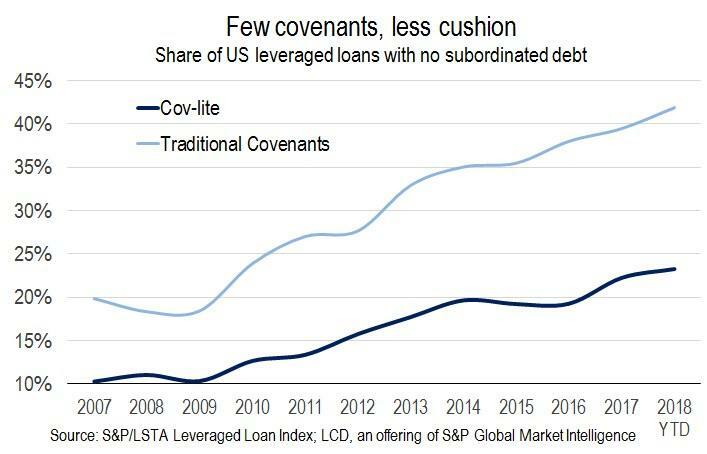 The punchline: this means that cov-lite loan outstandings are not only at record levels, but a greater portion of these transactions do not have any debt cushion to absorb losses in case of a default. Which implies that during the next default cycle, whenever the business cycle finally turns, loan investors not only will have virtually no "secured" protection, but are now the de facto equity tranche in numerous deals, or said otherwise, for the first time in history, loan investors are looking at 0 recoveries in default. Which is also why, as the WSJ concludes, this could leave lenders little choice but to extend the life of loans on whatever terms borrowers can afford, or as it warns "be careful what loans you buy now—you may end up stuck with them." And, ironically, instead of starting to tighten loan standards just as the party appears to have peaked and as rates continue rising, today's Fed survey confirmed that banks are making it even easier for companies to borrow, in the process spiking the punch bowl, just to make sure that the party lasts just a little bit longer and everyone is thoroughly hammered when the end finally comes.